Cribabi has just published their *unpublished* video – the acoustic version of Rihanna’s “We Found Love”. You can view it now only on the lead singer Yukari Fujiu’s Facebook. Crrrazy!!! Cribabi’s “Gloria“ is featured in the film “White Frog“. Film cast: Booboo Stewart (Eclipse, Breaking Dawn), Joan Chen (Last Emperor), BD Wong (Law and Order SVU), Harry Shum Jr. (Glee), Gregg Sulkin (Wizard of Waverly Place), Tyler Posey (Teen Wolf) and Kelly Hu (Hawaii 5-0). Soundtrack available on iTunes and Amazon.com. Cribabi (pronounced ‘cry baby’) is the band formed with Andy Cox, ex The Beat and Fine Young Cannibals, and Japanese underground star Yukari Fujiu. Yukari was the lead singer in an all-girl Tokyo band The Groopies before releasing two solo albums on Pony Canyon. She also wrote million-seller hits for several Japanese artists. Later, she came to London and worked with Dave Stewart of the Eurythmics, but during a weekend in Andy’s lo-fi Studio Zero, a sound gelled and Cribabi was born. In many ways Cribabi is a garage band. The vocals on their album Volume, re-mastered and enhanced for UK release on the Fidela label, were recorded in a bathroom or in Yukari’s kitchen in Tokyo. It is the best of east and west, with moody tracks like “Disappear”, “Gloria”, “I Can’t Go for That” alongside the harder edged pop of “Somebody to Love” and the ballads, “You’re So Sweet” and the Burt Bacharach-inspired “Beautiful Mistake” (which has been re-mixed into a garage track by the DJ, Bad Cop). Also there’s a cover of “Yesterday Once More”, originally by The Carpenters, a song that is classic Japanese karaoke. 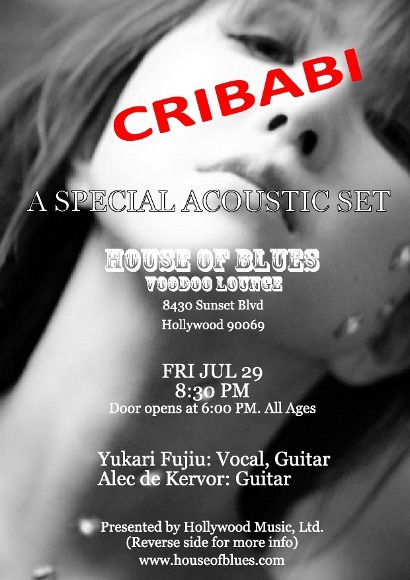 Currently Yukari lives in Los Angeles to make Cribabi’s live performances happen in the United States. If you dig new types of edgy sound or want to learn some naughty Japanese, must see.